One enthusiastic speaker told the meeting that there had probably been a ferry of some kind "for thousands of years" and it may even have started "by riding on the backs of dino­saurs". One local man, with a keen interest in history, was rather more precise. He submitted a letter which sugges­ted the wording on the plaque would be more accurate if it contained the inscription that the ferry had oper­ated for "at least 900 years". But neither view was taken up. According to a newspaper report on the meeting, no one knew exactly how long the ferry had been running so councillors opted to stick to recor­ded history and make no change to the plaque's original wording - that the ferry across the River Tamar at Saltash closed on October 23, 1961 "after more than 700 years' service". Local author Bruce Hunt, a member of Saltash Heritage, an or­ganisation based at the town's museum, recognises that there has always been a lively debate regarding the date when the famous ferry star­ted. While the waterside plaque, erec­ted by the Borough of Saltash, advocates more than seven centuries, historians, he says, argue that a much earlier date makes more sense. "For at least a thousand years the ferry was the most important in the West of England and the major influ­ence that shaped the development and expansion of Saltash," he writes in his latest book, which has been published to coincide with the town's "Ferry 50" celebrations. A Saltash resident for nearly 30 years, the ex-Royal Navy man has penned a compelling account of the ferry's story which actually stretches back to the time of the Norman Con­quest when there was evidence that Saltash Passage was a key crossing. The Valletort family owned the ferry rights until 1270 when they sold <?xml:namespace prefix = st1 ns = "urn:schemas-microsoft-com:office:smarttags" />TrematonCastle and their estate to Richard, Earl of Cornwall. Later, in the 14th century the bur­gesses of Saltash leased the ferry from the Duchy of Cornwall for � a year, with the Duchy providing the boat. The wind and fast tides of the Tamar could make the crossing in oared boats prolonged and hazard­ous. Robinson Crusoe author Daniel Defoe was not impressed when he made the journey in about 1720, stat­ing: "The Tamar here is very wide and the ferry boat bad, so that I thought myself well escaped when I got safe on shore in Cornwall." Thirteen years later the ferry actu­ally overturned and sank, with the loss of 20 lives. The book charts all the different types of ferry vessels used over the years and is packed full of memories from passengers and employees who, as part of their daily lives, relied on the floating-bridge service during its final decades. Among them was Gerald Truscott, a ferry engineman who joined the staff in 1949 on a wage of �18 shil­lings (�90). He left the ferry for a while to superintend the steam com­pressors working on the caissons for the towers of the Tamar Bridge, but returned to "see out" the last days of the ferry service before being appointed a bridge toll-keeper, having the honour of admitting the first vehicle to cross. "But that job was not for me," he said. "Sitting cooped up there like a budgerigar in a cage was very differ­ent from the freedom of the ferry's engine room." The Tamar road bridge opened on October 24, 1961 - the day after the ferry's last crossings when a carnival atmosphere gripped the waterfront. The honour of driving the very last car on to the ferry was won by a man from Quethiock. "I have caught this 11.15pm ferry by the skin of my teeth for many years and if I don't know how to do it, no one does," he said. 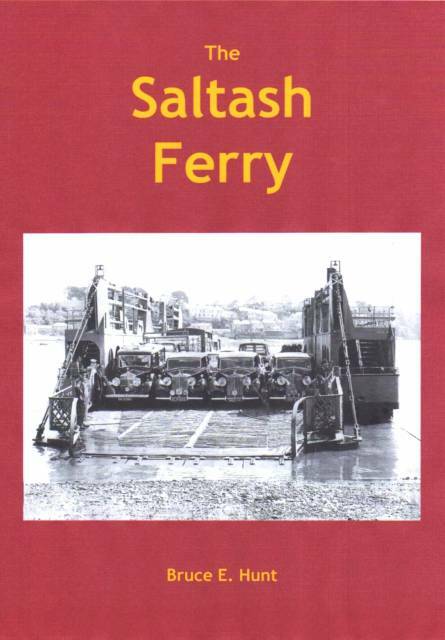 The Saltash Ferry by Bruce Hunt is published by BEH publications at �.95. Copies can be obtained from Saltash Heritage, 17 Lower Fore Street, Saltash, and The Bookshelf, 96 Fore Street, Saltash.